The good news, if you want to call it that, is that Arsenal are 16 points clear of 8th place, so West Brom can't catch them. That guarantees European qualification somewhere. But, Arsenal's already slim hopes of qualifying for the Champions League next season took a tremendous hit when they lost 2-0 to Spurs on Sunday, dropping 4.6 percentage points. Arsenal's odds of finishing in the top four are down to just 7.3%. Lose this Sunday and they could be as many as nine points out of fourth with four games remaining. That would demand perfection in their remaining fixtures against Southampton, Stoke, Sunderland, and Everton, not to mention help from the teams ahead of them. It wouldn't be mathematically impossible, but it's a big ask. There's still a 12.7% chance they fall to seventh and if that happens, they'll need to win the FA Cup Final to avoid having to play Europa League games as early as July 27. But what about the Emirates Cup!? All that said, let's just focus on what's important this weekend: beating José Mourinho. Granti Xhaka picked up a swollen ankle in Sunday's derby loss and has been ruled out of this weekend's pivotal fixture. As a bit of a trade-off, Shkodran Mustafi is back in full training. I mean, they don't really play the same position, but you know what I mean. Lucas Pérez was reportedly back in training as well, but picked up an additional knock, and is doubtful for this one, too. Sounds to me like something else is going on there. Santi Cazorla remains unavailable, but David Ospina is back in the fold, having returned to the bench last weekend. It's as you were with the rest of the players. The remaining question is whether Arsenal retain their recent formation of three at the back. Since the ideal was to regain some defensive solidity, I can't imagine they'd switch back to a 4-2-3-1 against Manchester United. Manchester United just played last night in the Europa League at Celta Vigo, which means a lot of this team news is going to be a wild estimate. We know that Marouane Fellaini will be out, since he's suspended. He was sent off against Manchester City for headbutting Sergio Agüero two weeks ago and will serve the second match of a three match ban. We know that Zlatan Ibrahimović is out with a knee injury, meaning Arsenal managed to avoid playing him in both fixtures this season. Marcos Rojo is also out with a knee injury, Luke Shaw might miss the rest of the season with a foot problem, and 19-year-old Timothy Fosu-Mensah is out with a shoulder problem. The rest are all question marks. Chris Smalling and Juan Mata have both been recovering from injuries, but both made the bench last night. Phil Jones, suffering from a toe problem, did not make the bench. Eric Bailly and Paul Pogba, however, both recovered from knocks and started. Arsenal's wins over Middlesbrough and Leicester City marked the first time since Boxing Day and New Year's Day that Arsenal had won consecutive league fixtures. They could not extend that streak to three, something they have not attained since early December. Astonishing really; since beating Stoke City 3-1 on December 10, Arsenal have played 25 matches across all competitions. They've won 13 of them, drawn two, and lost ten. Ten! Manchester United, on the other hand, have not lost a league game since losing 4-0 at Chelsea on October 23. That means they are unbeaten in 25 league games. However, they haven't won very many of them; they've won 13 and drawn 12. You'd think a team unbeaten in 25 would be higher than fifth in the table, but that's 24 dropped points out of a possible 75. The 52% winning percentage is the lowest among teams on a 15-match or longer unbeaten run in Premier League history. Five streaks in Premier League history have gone longer: United themselves have had two unbeaten runs of 29 games, Chelsea had a 29-match unbeaten run in 2008 as well as a 40-match run in 2005. Of course, the record remains Arsenal's 49. 5:09 p.m.: I'm not positive if the bartender here thinks this re-airing of the Arsenal game from Saturday is live or not. 5:25 p.m.: He seems to be rooting for United, so it should be fun when Giroud equalizes again. 6:20 p.m.: He turned it off entirely after Giroud scored. Arsenal won this fixture last year in swashbuckling fashion, 3-0. It came in the wake of their home loss to Olympiacos in the Champions League, so the circumstances surrounding the club, in terms of the must-win status of the fixture, was quite a bit like this match this weekend. The Gunners began the match on the front foot and didn't let up until they had three within 20 minutes. Alexis Sánchez scored in the sixth minute, Mesut Özil scored in the seventh, and Alexis scored again in the 19th. Arsenal took their foot off the gas a bit at that point, so by the end, United ended with 62% of the possession and twice as many corners as Arsenal, but Petr Čech made five saves to pick up the clean sheet. In 2006/07, Arsenal actually won both league meetings between the sides. 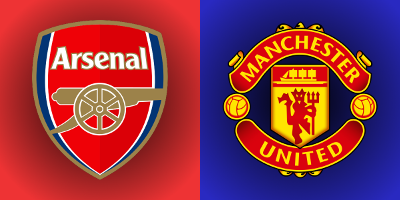 Since that year, across all competitions, United have met Arsenal 24 times. Arsenal have won four of those matches, drawn six, and lost 14. The referee is West Midlands-based Andre Marriner. Since Marriner was a part of that thing that time, Arsenal have a record of six wins, two draws, and two losses with Marriner in the middle. Peculiarly, both of those losses came at home to Watford, first in last year's FA Cup and then again at the end of January. So, since this isn't against Watford, we're in for some pretty smooth sailing, no? Aside from the loss to Watford, Marriner also took charge of the reverse of this fixture, the 2-0 win over Crystal Palace in early January, and the 2-2 draw with Manchester City in early April. For Manchester United, aside from the reverse fixture, Marriner has taken charge of their 3-1 win at Bournemouth, their 4-0 FA Cup win over Reading, and their League Cup Final win over Southampton this season. John Painting is a contributing writer to the Modern Gooner and is not prepared to only have access to blurry team logos for the Europa League next season. You can follow him on Twitter @zorrocat to provide design advice.